As women we all want to know the secrets to maintaining fitness success! And, especially after a competition goal has been achieved it’s important to have strategies in place to avoid post competition blues. We’ve all been there when we finish a fitness goal, we celebrate! Taking time out to reflect on our achievements is awesome, however if indulgences make a regular appearance on our weekly menu and our workout time decreases it can only mean one thing, an expanding waist line! I’m at my goal, now what? Many people follow a fitness challenge until they reach their goal. Once they are there, they generally relax their eating and slow down on their exercise. You need to adopt your gym sessions and healthy eating as a lifestyle rather than something that will come to an end. When you reach your goal and feel like it is time to relax, let your hair down and take a breather, the temptation to be lazy and skip the gym or eat for comfort, creep unnoticed into your life. When you recognise this, it’s time to take action! Find exercise you enjoy, try something new, come up with another goal, an event such as a marathon, a fun run or a fitness/bikini competition, then change your training to suit that goal, and change your eating to support that type of training. Imagine feeling like a princess and achieving your best on stage, only to come off the rails and destroy your hard work within a few short weeks! 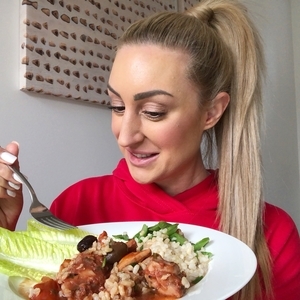 As Head Coach at Living Beauty Fitness I often ask myself, how can I help my competitors to stay lean and healthy when they finish the competition? The athletes “on stage weight” is achieved by a strict diet in the week leading up to the competition and therefore a few kilos will be naturally added to the athlete’s frame after the show. This post competition weight gain is normal, but the important factor is to not exceed this healthy weight gain. The solution is to adopt a healthy lifestyle for the long term and regularly set new goals. Counting Macros is a great way to stay on track on those days you want to have flexibility with your eating. A quick beginners guide to counting macros can be found by downloading your calorie tracking app and starting to familiarise yourself with the app and entering your data. To explain in the simplest terms, counting macros is where you track your daily calorie intake but also must fit these calories into a certain amount of protein, carbohydrates and fat. You will need to work out your target calories (based on your age, height, weight, activity levels and your body composition goals) and then divide this into daily targets to reach the desired levels of protein, carbs and fat. What you choose to eat is up to you, there’s no elimination with counting macros, it’s just about being aware of your distribution and knowing if you’re getting enough of the right kind of calories. It’ll take some work to get the hang of it, but it can be life changing. Some swear by counting macros and other people find it causes them to overthink food by having to record everything they eat into their tracking app. This is where a meal plan can be a great tool to plan your week and still include the foods you love. A meal plan is exactly as it sounds, a plan where you can have a weekly chart including your breakfasts, lunches and dinners, and your snacks. At Living Beauty Fitness, our Bikini Body Program is most popular for a healthy lifestyle. The program includes a delicious recipe book and the plans are new every fortnight with 3 meals and 2 snacks. Bikini friendly desserts are always included! The meal plan offers 3 options per meal and comes with handy shopping lists. Find active and fun things to do for example walking with a friend, a tennis match, running on the beach or a hike in the mountains. These things never feel like you are exercising. Also sit down with your trainer or coach and analyse your comp results and body parts that need improvement. This way you can structure your “off season” training program to bring up those lagging body parts and ensure you look different and make improvements for the next time you step on stage. For example, if your goal is better glutes, perhaps restructure your routine to include 3 glute sessions, 1 leg session and 1 upper body and abs. Working out is a great stress reliever and many women that enjoy fitness can relate when they have had a busy day, the best way to de-stress is at the gym! Try to look for other benefits of working out, rather than just aesthetics. Post competition it is time to make improvements. This means training hard, working on your weaker points and using smart supplementation to recover well and set your body up for next season! Just lately ‘gut health’ has become a buzz word, and rightly so because our health really does start in the gut. Gutright, by ATP science promises to improve your intestinal flora with the use of modbiotics. Their 10 day protocol includes 3 serves a day of this product in water or a smoothie and sticking to a diet of clean foods with the following list provided. This product starts with a 10 day protocol where every day for 10 days you take one serve at breakfast, lunch and dinner. It is a powder that is mixed with water. Some don’t like the taste, but I found it ok.
A modbiotic is a complex of polyphenols, polysaccharides, glucans, lectins, and other compounds that modulate microbes toward an anti-inflammatory and anti-obesity profile through combinations of antibacterial, antifungal and anti-parasitic actions that reduce excessive firmicutes and increase deficient bacteroidetes. GutRight by ATP Science is an evolutionary step in healthcare using all of the most recent scientific findings and discoveries and a step back in time to before modern man and science intervened with nature’s plan. After hundreds of years of research into the gut and its governing role over so many other systems in the human body and overall health, we have gone full circle to realise that the man’s best efforts and genius do not come close to the intricacies of synergy and the intelligence that nature possesses. This protein powder tasted great and is dairy free. It contains bio-active peptides that don’t require additional digestion, meaning once they hit the gut they can be absorbed by the body completely as they are. 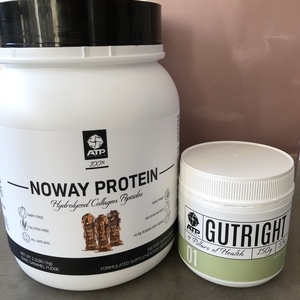 In addition, NOWAY is gluten, dairy and bloat free, whereas Whey Protein can create digestive upset and bloating in some individuals which reduces the Bio-Availability (or the body’s ability to break down the protein). This is a protein powder and the reason I recommend it is because without a convenient source of protein you may not be able to recover as well from workouts and develop lean muscle, but of course it is up to you. If you feel you can eat enough protein during your busy day then you may not need it, but most people find they need this to reach their protein targets, and as a bonus you can also use it to make yummy recipes such as protein pancakes, shakes and protein baked recipes such as Choc Raspberry Muffins. You should always stay active, always eat healthy. There is no end point!